Something remarkable happens when men get together and play with fibre. 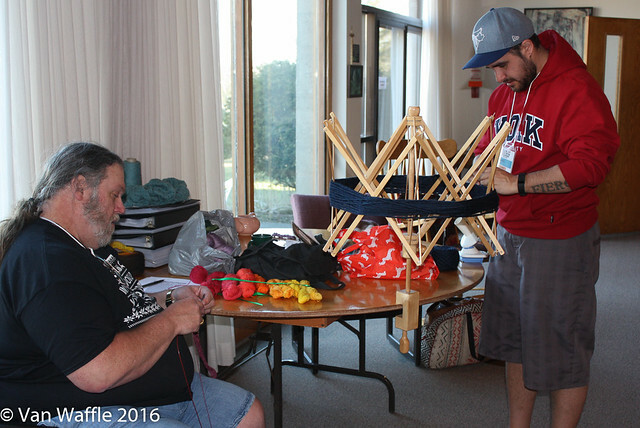 The first Men’s Knitting Retreat North kicked off yesterday afternoon with an informal meet and greet as guys arrived from as far away as Germany, Texas, Florida and Colorado. Ontario put on her best spring weather as if to show off to our international guests. Old friends greeted happily and new ones forged quickly. Conversation ebbed and flowed, usually most lively around our friend Jeff Cohen, a champion of men’s knitting retreats. But everyone settled down quickly to knit or spin. It was a diverse group as shown by the wide range of projects people had brought: practical socks, splendid shawls, fluffy cowls. And there were several new knitters, too: guys who have only been knitting for a few weeks. We paired them with mentors in hope this weekend will help launch illustrious creative careers for them, too. Others here have been knitting 40, 50 years or more. This is the first such retreat to take place in Canada. It was largely inspired by the Men’s Spring Knitting Retreat, which takes place at Easton Mountain near Albany, New York, each spring, and has spawned several other annual events around the world. The photo above shows designer Leo Pola starting a shawl in flame colours, and my pal Benn Brisland (this is his first knitting retreat) preparing yarn for the workshop I’ll teach later this morning: how to knit a moebius cowl. With weather so fine, undoubtedly we’ll take frequent breaks from structured activities to enjoy the sunshine and landscape at Loyola House Retreat Centre. AJ Young and Han Jacobs Meadway had the right idea within a few minutes of arrival yesterday. Still, I especially look forward to seeing how creativity and friendships unfold over the course of the weekend. 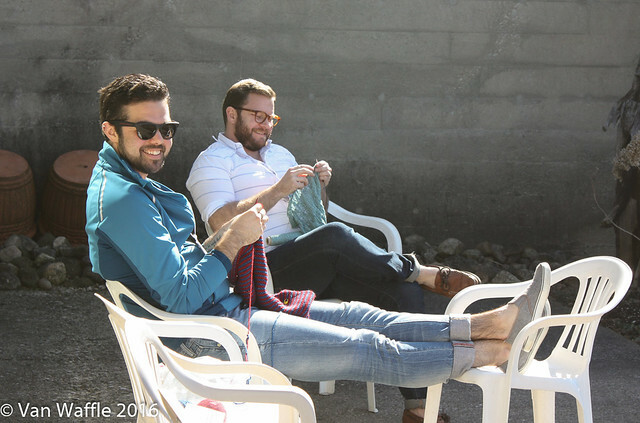 Men’s knitting retreats are good at building community. People who have attended different ones around the country tell me each has its unique flavour. I don’t want to anticipate too closely what ours will be like, but this weekend already has a restful, reflective feeling to it. After this morning’s workshops and lunch, we’ll head on a field trip to Wellington Fibres to view a lot of baby goats and probably buy a lot of colourful mohair yarn and spinning fibre. This is so wonderful! I’m glad you got if off the ground. And so well attended, too! Congrats on job well done, Van. Looks like the weekend was a success. Congrats to you. Thanks, it was a resounding success. I just posted another update.